I would like to talk about a photograph I saw and commented on at a photography site I visit when I have time. I found it very interesting both as a photograph and as an example of how we perceive the image content, I asked for permission to use the image from its owner, Jarno Saren, who graciously allowed me to use his photograph as the subject of one of my blog entries. So, here we are and I want to start first by showing you a part of the photograph to set the stage. Take a look at the photograph below and think about the stairs. How would you describe the directionality of the stairs? I would call this “stairs going up” as the viewing tends to move from left to right, and my eye enters the frame from the left side and is drawn up by the shiny rail and the stairs. I want to establish a common understanding between you and I as we look at this photograph. It also has a strong tonal contrast between its highlights and shadows, and graphical contrast enhanced by the small grid pattern and the smooth railing. So, in many ways, it has contrast. Now, take a look at a different version of the photograph and again think about how you would specify the directionality of the stairs. Again, entering the picture from the left, my eyes follow the rail and the stairs from the upper left corner to lower right corner. I would call this “the stairs going down.” I hope you agree on the different perception a simple horizontal flip causes in the same photograph. This is one level of exploration I wanted to do, the perception of directionality created by the composition. Now, I will show you the full-size image in two ways and tell you why I think one version is stronger than the other one. Take a look at this one with the shadow of a person, I see it like a man, and try to assess the feeling you get from the photograph. I don’t know about you, but I seem to walk down with the shadow. In fact, it may even be “my shadow.” The presence of the shadow adds a sense of movement along the direction of the stairs, everything is moving down. I think at this point you probably know where I am leading with this, so take a look at the flipped photograph. The feeling, at least to me, is dramatically different in this one. I am at the bottom of the stairs getting ready to climb up, and the shadow belongs to a person coming down. We are moving in opposite directions, we will meet somewhere and may even say hello. There may be even some ominous feeling coming from seeing the shadow and not knowing who the person may be. 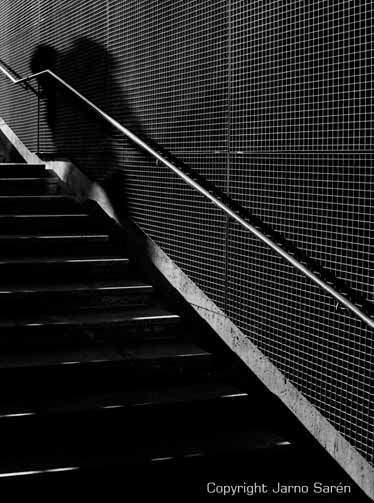 In addition to the very different feeling, in the last version, there is a perceptual contrast in addition to the other contrasting elements I noted earlier, the direction of the stairs and the direction of the shadow create strong tension. This version, with all the elements coming together with additional tension is a stronger image for me. It has strong film-noir qualities that the other version lacks. So, next time you look at a scene like this or view a photograph with similar elements, consider flipping it to see what it does to your perception. I consider seeing fundamentally a mental process and this photograph very nicely illustrates the point. Thanks, Jarno Saren for allowing me to use your photograph.